Its slow so unless your a fan of heavy dialog i wouldn't recommend it. however i was captured. even though after finishing the first episode i cant really tell you much about the show at all. I give it a 3 out of 5. Even though i cant think of to much i hate about it. nothing about this show really stands out. This anime varies from the rest.. the style, the way it's actually based on a novel and not a light novel.. based only on the first episode this anime kept me as a viewer alert and intrigued for what's happening, the transitions from scene to scene were really smooth and the overall feel is a very satisfying curiosity that you are left with. The music gave me hyouka nostalgia, it's so smooth and complements the whole episode. I say I like where this is going and I really hope it keeps up the amazing style. The opening to this Anime seems very fun filled with a soothing music to fill the Anime; though not much was revealed. This Anime is based off of an actual novel and, from what I can tell, it is going to be very dialog heavy (so pull out your reading glasses). Few characters were introduced, and only three were revealed long enough for you to grasp. This episode felt like all it did was raise questions for the audience. The 3D and 2D fusion of graphics has been done rather smoothly, not perfect, but very clean. If you want to pickup an Anime that looks like it's headed in a good direction "The Perfect Insider" will be releasing new episodes every Thursday. Something finally worth watching this season! Finally! I've just about given up hope on this seasons line up. I now have something to look forward to every week.. it seems to be a very intellectual anime, looking forward to seeing what's to come. The Alfa Romeo in here is absolutely gorgeous!!!!! This is a tentative four stars right now as I just know this is going to be a series where I'm going to basically have to be finished before I know how I feel about it. The atmosphere is perfect and while it is a bit dialogue heavy, I felt it enhanced rather than weighed it down. The first episode was very much an Introduction and Set Up but already you could feel the mystery and important elements we don't yet know crowding around. I can't say I like any of the characters, the genius Dr. is too unknown, the professor too academic, and the student a bit too manipulative. But I do think The Perfect Insider could be one amazing story. 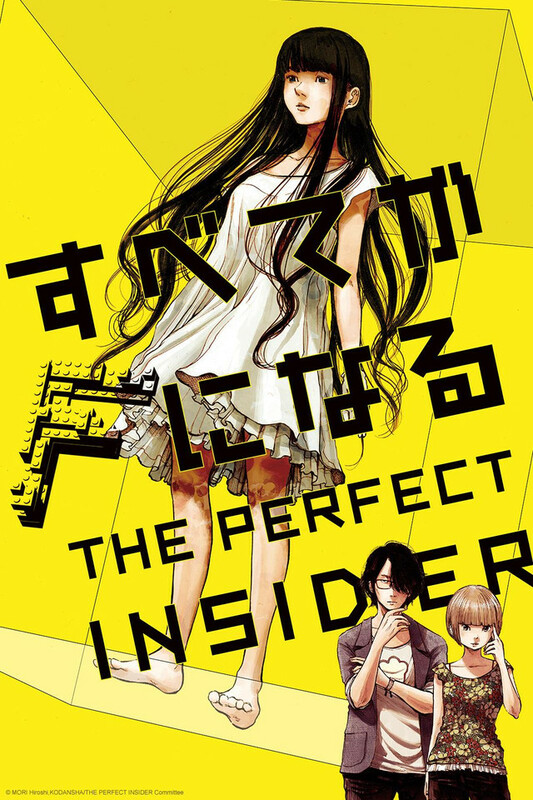 So The perfect Insider was originally a novel, then turned Live Action Drama Series in early 2015, and now it has an Anime version. In conclusion, this is a Slice of life , murder , detective , school life ,physiological genre... I would recommend you watch both Live action and the Anime Series. I must say there are many pluses to this anime already. Great graphics. Dialog fits the realistic setting. Only a few characters, but their interactions already grip the plot in unexpected ways. The plot is focused and is taking its time each episode, like a nicely taut knot that is being pulled at delicately in these first episodes. I have not read the novel this is based off, but I am most impressed just having seen the first few episodes. Just an fyi, this and Bones are up there in my favorites for the season. I know the genre is not new for anime by any means, but the chosen dialog, animation and sound choices are of a very high quality. Something I would not expect for something in a special niche. The opening theme is fun as well. Definitely check it out and get in on the weekly anticipation now while it is happening. it starts good and i have high hopes. Can it get more bland of an anime?? I dunno how about a weird profesor talking to a computer program and it has a murder in there some how.. I almost fell asleep after the first five minutes, I guess i'm just not getting this anime or it does not appeal to me. It seems like the only reason people give it 5 stars is to appear to have a greater depth of character. (written at 3 episodes) This is an anime that, so far, does an excellent job of keeping its viewers intrigued and involved in the story and what's going on, even when you don't know what's going on. It becomes quite clear early on that this is a mystery, with hints of romance and philosophy thrown into the mix. One thing that may frustrate viewers or turn them off from this is its incredibly slow pacing and very heavy dialogue. But, rest assured it does in fact get more interesting and doesn't drag on as much later. The two main characters, Moe and Saikawa-sensei, are characterized very well, and aside from how Saikawa-sensei's ramblings may get annoying early on, they're both likable enough. However, spending so much early focus on them and their interactions may not have been such a good move, as I feel like their relationship isn't interesting or dynamic enough to warrant so much time spent on it. Luckily, it seems this isn't so much the case after the first couple episodes. The dialogue is very smooth and well-written. The visuals are superb and it has a unique style, which is actually what drew me to watching this in the first place. I'd definitely recommend it to anyone looking for a good mystery or even just a good anime as long as you don't mind slow-pacing and heavy dialogue.